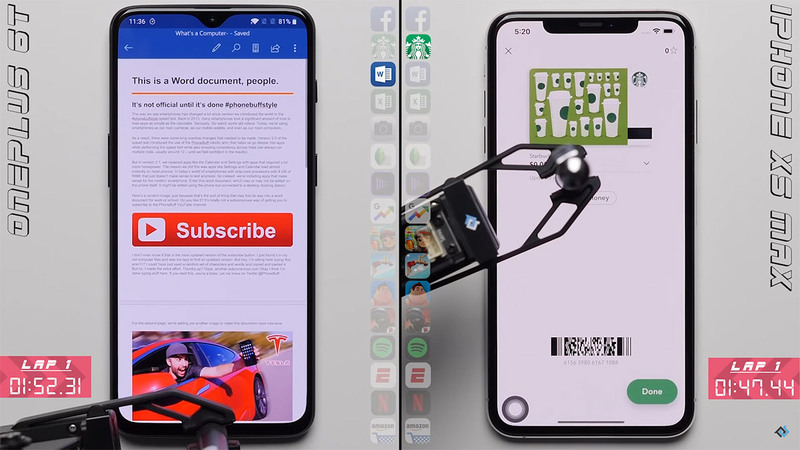 We’ve voiced our concerns about whether so-called real world phone speed tests really mean anything before, but that doesn’t mean they are any less entertaining to watch, so when we saw that PhoneBuff had taken a newly released McLaren Edition OnePlus 6T and pitted it against an iPhone XS Max, we got interested. The iPhone XS Max has proven difficult to beat so far, with many high-end Android phones struggling to compete, including the mid-range priced but super-impressive OnePlus 6T. Would the McLaren Edition fare any differently? For those unfamiliar with how these tests are carried out, one of each competing phones is put through a suite of app and game loads to see which does it the quickest. Apps are loaded and then reloaded to see just how memory management alters how apps behave. With the special edition OnePlus 6T boasting a massive 10GB of memory, the obvious question was whether that would give it an edge over the iPhone XS Max with its comparatively paltry 4GB. We won’t spoil the outcome for you, instead go and check out PhoneBuff’s video for all the details. We’ll just remind you that Android and iOS handle apps in very different ways, especially when it comes to multitasking. It’s roundly known that iOS doesn’t need huge globs of memory in order to function, so the 4GB inside the iPhone XS Max is plenty for what the phone needs to do. In fact, we’d argue that the 10GB in the updated OnePlus 6T is overkill even for Android, but we know some disagree. With that said, check out the full video and let us know your thoughts on the outcome. 10gb of RAM in any cellular device is ridiculous. Paying over 11 hundred on a phone is ridiculous. trying to sell a slightly uptiered yet already depreciated device for $700..
PhoneBuff does such a great job with speed tests. I wonder how much they spent on the development behind that robot.